I am a big fan of the Dragon Ball series. I have been playing games in the series since Dragon Ball: Advanced Adventure for the Game Boy Advance, and I have been watching the anime series since it first premiered on Toonami in 1998. 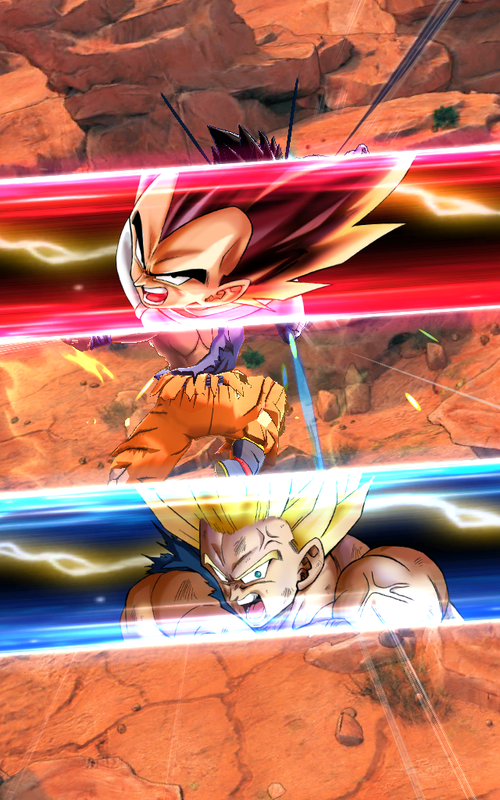 So when Dragon Ball Legends for iOS and Android OS was revealed during the BANDAI NAMCO Entertainment Mobile Showcase at GDC 2018, it had a lot of personal expectations to live up to. And from the brief demo I was able to play, it succeeds at every imaginable level. Super Saiyan Goku, Pan, and a new character designed by Akira Toriyama for Dragon Ball Legends face off against a team of Freiza, Vegeta, and Nappa. (Image courtesy of BANDAI NAMCO). When you first choose to go into a fight, you have to select a team of three fighters from the ones available. For this demo, I had a choice between Super Saiyan Goku, Pan, Piccolo, Vegeta, Frieza, and Nappa. Even though each character has the same basic move set (attack, dodge), they all have different special moves available to them. 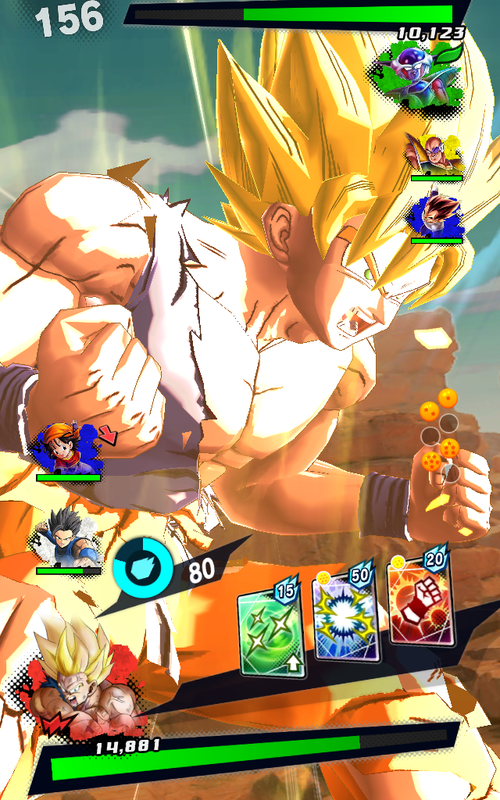 Before I dive into the combat system and how it works, it must be noted that Dragon Ball Legends’ graphics are absolutely gorgeous and look like they belong in the anime series. I played against both computer opponents and against real life opponents over a cellular connection (we didn’t have WIFI to use), and I honestly couldn’t tell the difference in gameplay quality between the two due to the Google Cloud Platform that is powering the underlying game to ensure that there is a consistent and quick-paced connection between mobile users no matter where they are worldwide. Play against people worldwide on your iOS or Android phone. (Image courtesy of BANDAI NAMCO). The combat system itself is fairly simple: tap on the screen to attack, swipe one way to move closer to/further away from the other fighter, and swipe in another direction to dodge. Special attacks are launched differently than your basic melee attacks. Along the bottom part of the screen, a series of four ‘arts’ cards appear that constitute melee attacks, ranged attacks, and special abilities. When you click on one, it both gets used during battle and depletes your energy points down by its point value (which is separate from your health bar that goes down when you take damage). Some arts cards also randomly have a dragon ball on them in the top left corner. 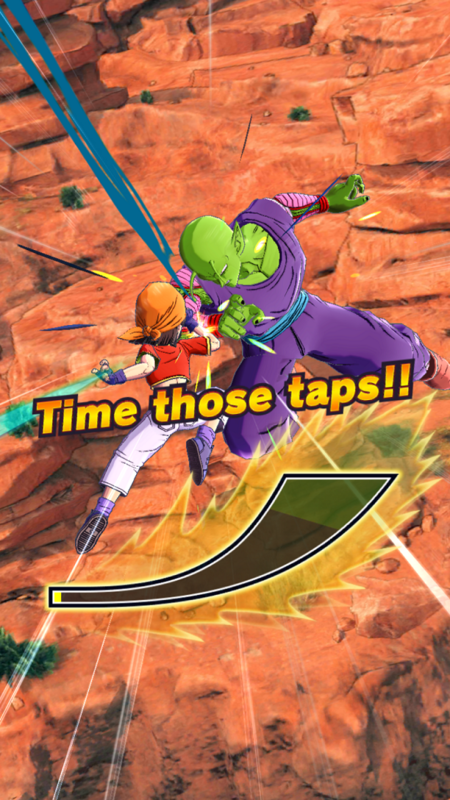 When you use those ‘dragon ball’ cards, that empty slot on the dragon ball gauge on the right hand of the screen fills up. 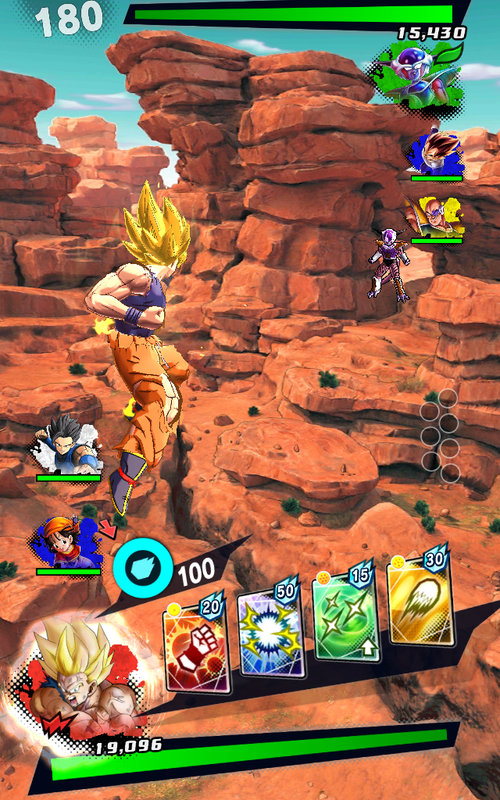 When all of the dragon ball slots are filled up, you can use the Rising Rush ability, which deals significant damage and can wipe out multiple opponents on the opposing team in a series of fun-to-watch attacks. 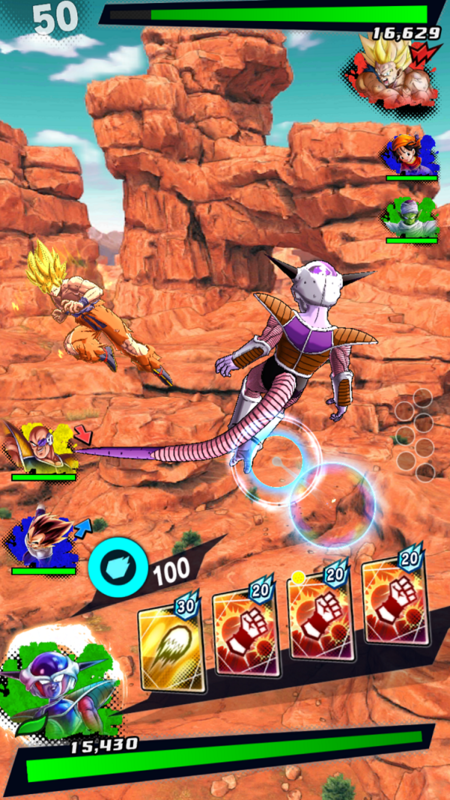 Characters can also ‘clash’ during battle, which results in both players tapping the screen repeatedly to determine who wins out and does a significant amount of damage to the other player. Clashes will happen during battle between fighters in Dragon Ball Legends, and the player who taps batter will win the clash. (Images courtesy of BANDAI NAMCO). All of this sounded complicated when it was explained to me, but I found that it really wasn’t when I put it into practice in Dragon Ball Legends. Instead, the combat flowed smoothly and matches went by quickly, and it wasn’t so much a fighting game that depended on ‘counting frames’ (like in a lot of fighting games) but instead relied upon tactical thinking and being able to know when to dodge, when to get close to your opponent, and when to launch your card attacks. I am left-handed, and I purposefully tried out multiple battles (both against the computer and against another player) with only my thumb doing everything, and I found that I had no difficulty playing Dragon Ball Legends and either winning or coming close to it. Super Saiyan Goku launches an arts card attack. (Image courtesy of BANDAI NAMCO). In other words, based on the basic combat demo I was able to play, Dragon Ball Legends is a fun, quick-paced mobile fighting game that just works. This game is currently scheduled to come out during Summer 2018, and I honestly can’t wait for it. If you have an Android phone with an OS of Android 6.0 or later, you are able to potentially get in for beta testing Dragon Ball Legends. While the first beta round’s application period is now concluded, the second beta round’s applications open up from April 1st to April 8th, and 30,000 testers will be selected from that pool. You can find out more here. There is also a pre-registration program (with rewards bonuses for when the game launches) for Google Play and the App Store here. What do you think of Dragon Ball Legends? If you could have anyone from the Dragon Ball universe on your team, who would it be?